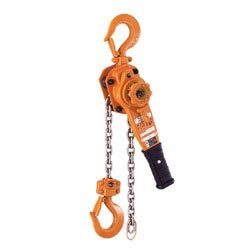 We are a renowned organization that is engaged in Supplier, Exporter and Importer a broad spectrum of Kito Lever Block Chain Hoist. To guarantee protected transit of the offered range, we pack these hoists in best quality packaging material. It is widely demanded due to its best quality features like resistance to heat, efficient functionality temperature or corrosion. Our team of expert professionals matches them to industrial standards of quality.